Description: This Ruger 10/22 Take-down Lite (model 21163) is a semi-auto rifle which fires the .22 long rifle round. It has a satin black finish with a 16.12" threaded barrel. 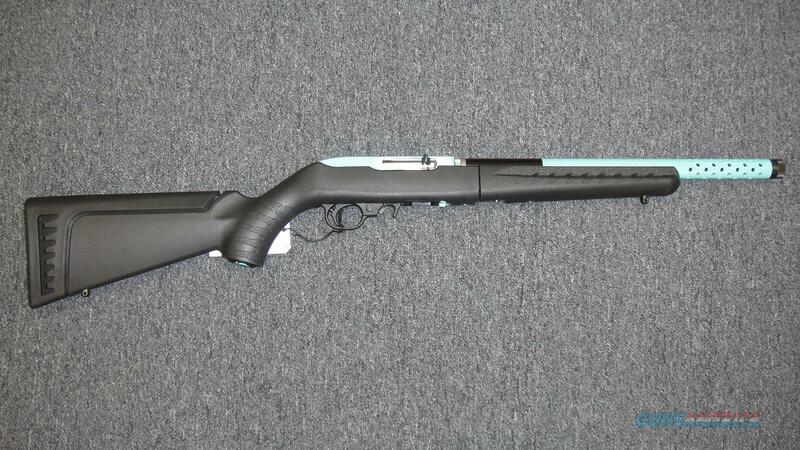 This brand new rifle has a Turquoise aluminum barrel sleeve and a Turquoise receiver. Easy take-down enables quick separation of the barrel from the action for ease of transportation and storage. This rife features the Ruger Modular Stock System with a low comb, standard length of pull (ships with an additional high comb, standard length of pull stock module). It also comes with a combination scope base adapter for both Weaver-style and .22 tip-off scope mounts, one 10-round magazine, a zippered carry case, and two Ruger Morale patches.